When it comes down to engagement rings , celebrities can give the best of the best, so what exactly are they choosing? Whether they choose for a vintage-inspired design with a white diamond like Nicole Richie or a more modern style with a yellow diamond like Kristen Bell, there is an overarching trend: a platinum setting. First of all, remember that smaller diamonds are your friend, too. Whether it’s a halo around the center stone, or a cover setting, these smaller, more economical stones closely fit together give your ring a ‘big diamond’ look. Stars like Katherine Heigl and Gwenyth Paltrow framed their center stone with pave diamonds, complete with a pave band. Also, instead of a diamond, you can opt for a colored center gemstone like a sapphire or citrine. Not only will it show your uniqueness, but they are far less expensive than a diamond…just ask Penelope Cruz! Go vintage! Vintage rings have a sweet and elegant style – they reflect utmost complexity, but without pretention. Both Katie Holmes and Ali Landry chose a vintage-inspired situation for their engagement rings, but you can do one better – try incorporating heirloom pieces into your ring’s design to make that milestone purchase as sentimental as it is smart. Last but not least, possibly one of the most vital things to remember is that it’s not all about the diamond rings. Obviously that’s generally the major focus when choosing a ring, but what’s holding it is just as valuable. Choosing a metal that’s going to stand up to the rigors of everyday life, while retaining its structure and beauty, is a very cost-effective, long-term selection. Platinum won’t tarnish, is very tough, and doesn’t ever lose metal. Leading ladies Fergie and Beyonce both opted for platinum to make sure their rings could withstand life on – and off – the stage. 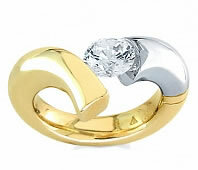 Novori Jewelry can help you with all your diamond jewelry needs. Just give us a call!